Eclectic (at Best): Lavender Dog Biscuits Forever! Last year while visiting Friday Harbor on San Juan Island (Washington state), I found myself in a type of store that I had never seen before. The store, Pelindaba Lavender, sells products that are lavender scented or lavender flavored. The store is not a small one, and it has shelves lined with a slew of products, many of which a person would never associate with the plant. According to the Pelindaba Lavender website (http://www.pelindabalavender.com/the-stores), the company sells over 240 products. The Friday Harbor store has a relaxed new-age feel, with calm music, subdued light, and stolidly earth-mother type sales persons. Most of the products are crafted, not mass made; some are created by local artisans. They are attractively packaged. Though not cheap, prices seem reasonable for premium goods. The largest array of lavender products is for "personal care"; they include soaps, shampoos, creams, and other skin care products that incorporate the lavender scent. A related set of products are called "therapeutic," purportedly useful for reducing headaches and providing other health benefits. Another set of products is for the home (to make things smell better), and floral decor and candles can be included on this list. Pelindaba Lavender's most surprising products are those created for pets, including lavender-flavored dog biscuits. They look good, but I did not sample them. However, I did sample some of the food products for humans. These include flavored chutney, honey, sugar, and chocolate. Even more exciting: you can snack on lavender chocolate chip cookies while sipping lavender flavored lemon aid. I bought some lavender-flavored coffee beans, which turned out to be a nice treat on occasion. After this visit to the Pelendaba store, I filed information about it under "might be good place to buy Christmas presents for someone who has everything," and promptly forgot about the store. I was reminded of it this August when two friends from Athens, Georgia, came to Northwest Washington for a visit. 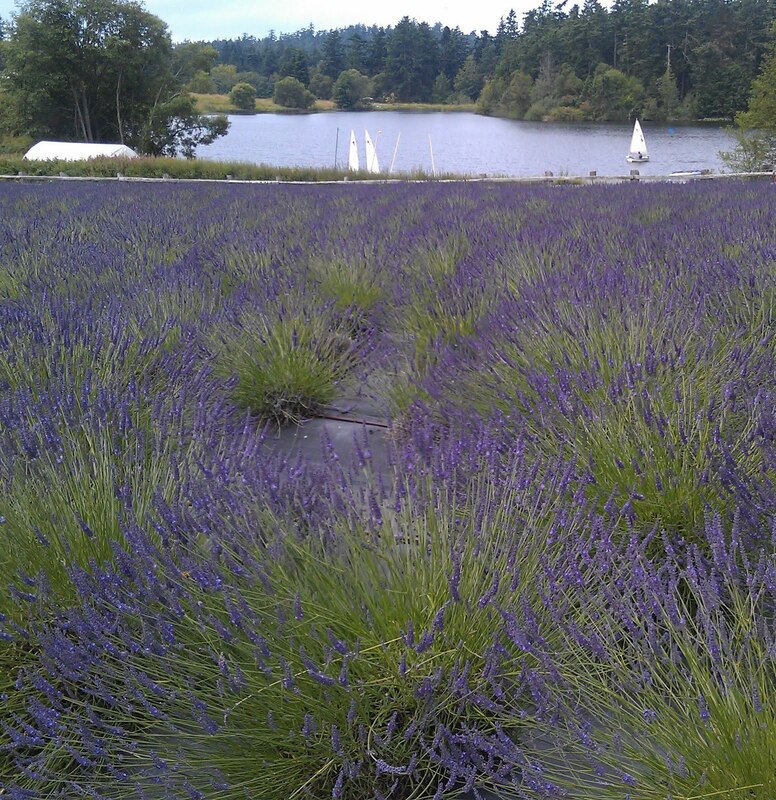 On their list of things to do was: visit a lavender farm on San Juan Island. I was happy to join them. So, Harry and Brenda Hayes, with me tagging along, drove from Birch Bay to Antecortes to catch the ferry to San Juan Island. (How come I always think it is too warm to take a jacket on a ferry ride, and it never is?) With little effort (and help from a GPS), we quickly found the Pelendaba lavender fields, which provided sweeping views of deep purple. 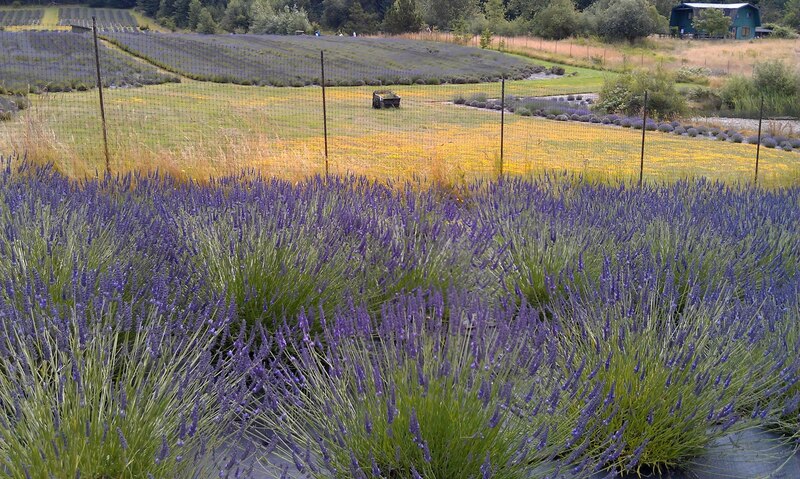 The farm has lavender plants carefully cultivated in neat, long rows. 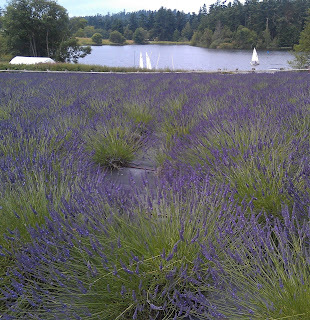 It grows several different types of lavender plants (who knew there was more than one? ), which are different sizes, shades of purple, and configurations. 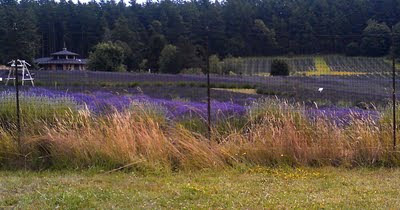 Most of the lavender fields are fenced it, with admonitions to keep dogs outside the fence. The cultivation is organic. 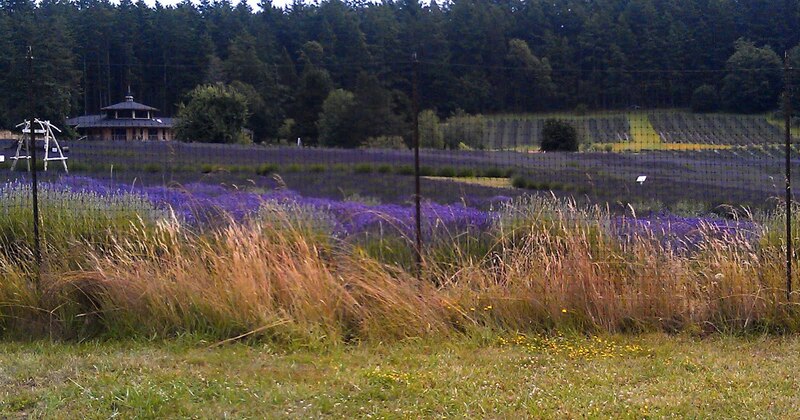 Some signs in the fields explain that this San Juan Island land is not optimal for growing lavender. Apparently, it has the wrong type of soil (too acidic or too alkaline) for the best lavender, and the sloping land has sub-optimal drainage. Nevertheless, the owners have created beds that suppress weeds and provide the right amount of water to grow a vista of striking plants. The farm has a store, plus exhibits that explain how the lavender essence is extracted from the plants and used in its products. After drinking some of their lavender lemon aid, I concluded they were doing a good job. Brenda, Harry, and I enjoyed visiting the lavender farm, and agreed that it seems to be a clever entrepreneurial idea that has been nicely executed. This type of artisan, sustainable business is well suited for an island economy and provides it a valuable boost. We lifted our bottles of lavender-flavored beer to toast the Pelendaba Lavender farm and wish it prosperity. Such a beautiful place! 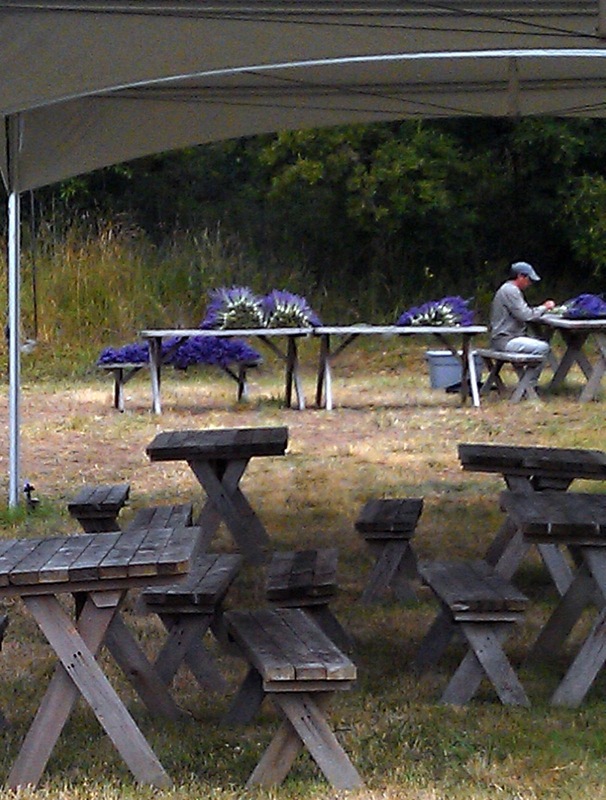 When I decided to go out to "cut my own" lavender, Dan did a great job choosing the most vivid variety and directing at what length it should be severed. Not only a poet, Dan also has a bit of an artist's soul. Who knew!